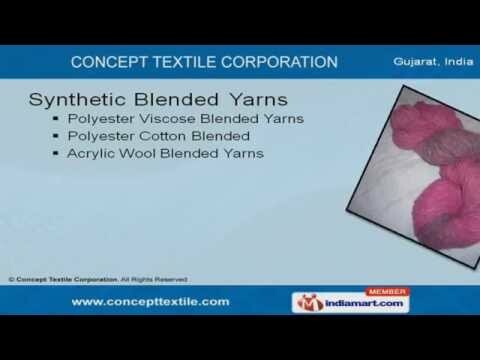 Welcome to Concept Textile CorporationExporter & Supplier of Textile Yarns & FabricsIncorporated in 2003, at Ahmedabad, we are an ISO & BVQI certified company. Our State of theart infrastructure & stringent quality review have helped us to serve China, Europe, UK & othercountries. Strict adherence to quality, Specialized R&D wing & Diligent Manpower are the strengths of ourorganization. We offer a splendid range of Fabrics, Synthetic, Spandex & Elastane Yarns. Polyester, Viscose, Carpet & Acrylic are some of the well known types of Synthetic Yarns. Our Synthetic Blended Yarns are best in terms of quality. You can also avail from us a wide gamut of Cotton Yarns that are widely acclaimed in themarket. Along with that we provide Denim and Fabrics that are class apart. Our Spandex & Elastane Yarns have gained immense popularity in the industry.